Hopefully the fall season has the Texas outdoors calling your name. If so, take your family and friends on a camping excursion! Follow these tips to make it an eco-friendly outing. Pick a nearby park or campground. A shorter drive means saving gas and reducing emissions, not to mention more time enjoying nature. Find a campsite in a state park near you. Borrow camping gear, or buy it used. Bring reusable dishes, silverware, and cookware. Pack cloth napkins and towels. Steer clear of bottled water. Fill a large container or cooler with water and use refillable water bottles. Try LED flashlights and lanterns, and buy rechargeable batteries. Practice safety when building a campfire. Be aware of any burn ban, and follow Smokey Bear’s safety guide. 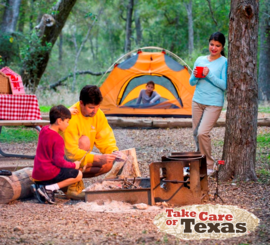 If camping is new to you, let the Texas Parks and Wildlife Department help you and your family gain the skills. Texas Outdoor Family will provide all the gear and know-how needed for up to six people to learn how to camp. You just bring bedding and food. 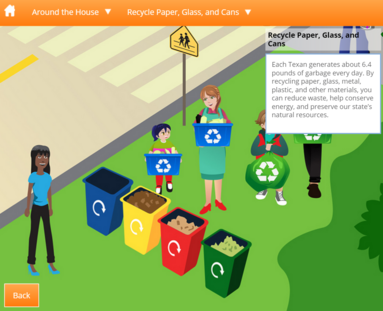 The Take Care of Texas website now offers an interactive feature to teach kids simple ways they and their families can do their part for the Texas environment. Kids can cruise through the town and click on different features to learn how much water and energy can be saved, pollution prevented, and waste reduced by making simple changes in things they do every day. Explore it now! According to the Texas A&M AgriLife Extension Service, now is a perfect time to add a new tree or grouping of shrubs to your landscape. Fall months of September through December have distinct advantages. Plant roots grow anytime the soil temperature is 40 degrees or higher, which may occur all winter in Texas. During the winter months, the root systems of the fall-planted specimens develop and become established. When spring arrives, this expanded root system can support and take advantage of the full surge of spring growth. Dig a hole large enough in diameter so the root system has at least six inches of clearance on all sides. The root ball should rest on a solid soil foundation, so don't dig the hole much deeper than the ball. Plant the tree or shrub slightly above the level of the surrounding soil, to allow for settling and increased soil drainage. Carefully place the tree or shrub in the hole. Handle the plant by the root ball, not by the trunk. A broken ball of earth can mean a dead plant. Always remove any container before you plant. Backfill the hole, using only the native soil removed from the hole; do not use soil amendments when planting large shrubs and trees. Fill the hole, and firm the soil around the plant. Water thoroughly to settle the soil around the roots and to eliminate any air pockets. Do not fertilize your tree or shrub after planting. Wait until early in the spring to do this, and even then, go lightly. Heavy applications of fertilizer may burn and injure the root system, and could possibly kill the plant. Find the best tree for your yard. TCEQ is offering funding through the Texas Clean School Bus Grant Program—a program designed to improve the health of school children and bus drivers by reducing emissions of diesel exhaust from school buses. These grants provide money to purchase and install devices on diesel-powered school buses to reduce emissions. More than 7,200 buses across the state have been retrofitted since 2008. Applications will be considered on a first-come, first-served basis through Dec. 2, 2015. While there is not a limit on the amount of funding that can be applied for, the amount of the award will be at the discretion of the TCEQ. Download the Request for Grant Applications, and get your school's buses in line for these retrofits! Show your Texas pride by ordering a plate for your vehicle, motorcycle, or trailer. $22 of the $30 fee goes to support our program! Order now; you don't have to wait for your current registration to expire. Don't miss this opportunity to be recognized or recognize someone else for their hard work to Take Care of Texas! Deadline to apply extended to Oct. 9. Apply today! It's not too late. Plan an event in seven days. Visit walkbiketoschool.org (funded by the U. S. Department of Transportation) to download a guide on how to plan an event at your neighborhood school. Even with little time to spare, the site offers tips to plan an event in seven days. Encouraging students to walk or bike to school is fun, creates healthy habits, reduces car emissions, and builds a sense of community. Mark your calendars now for Bike to School Day, May 4, 2016. Isn't it scary to think that whenever your TV, computer, and other appliances are plugged in, they are quietly draining electricity all day, every day, even when they're turned off? This phenomenon is sometimes called vampire power or standby power—the electric power consumed by products when they are switched off or in a standby mode. It accounts for 5 to 10 percent of residential energy use, costing the average household up to $180 per year. Unplugging or turning electronics off at a power strip allows you to eliminate the energy sucked for vampire power. When you replace electronics, look for the Energy Star products that have lower standby power. Plants that are native to their location help conserve water and protect the soil, and require less pesticide, fertilizer, and maintenance—all saving you time and money. The deep root systems of many native plants also increase the soil’s capacity to store water and reduce runoff. In addition, native plants attract a variety of birds and butterflies by providing habitat and food. The Lady Bird Johnson Wildflower Center offers the following resources on Texas natives. Native Plant Database - Search native plant records by traits or names. Image Gallery - Browse through this collection of native plant images. How-To Articles - Don't know where to start? Try these articles. Get together with political leaders, neighborhood associations, nonprofits, businesses, and students to discuss ways to improve the Texas environment. There is no fee to attend, but you must pre-register. Register today. Make your business a Take Care of Texas Proud Partner today!